You are here: Home / Healthy Living / Read this Before Purchasing Seeds for your Garden! 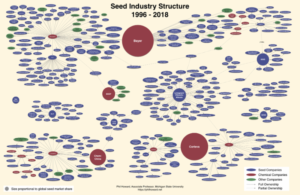 At first glance it may seem like all seed companies are alike. If that was the case, it would make sense then that you should just go for whatever is the cheapest, however, this is not the case. These four firms now control an estimated 60+% of global proprietary seed sales. China’s ChemChina and Longping High-Tech are now ranked in the top ten in global seed sales. Both firms are planning more acquisitions in the near-term. The best thing to do when buying seeds is to find a local provider. Local seed providers have developed seeds that are adapted to your specific region, meaning they should grow better and have more vigor. If you can’t find the seed you’re looking for from a local provider, the following companies provide quality seeds and are not associated with the Big 4.